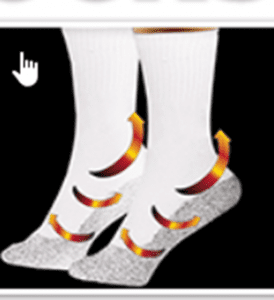 We have talked about different types of socks in the past but mostly with the focus on their ability to help with circulation. We can’t forget about the true meaning of this type of attire which is to keep your feet warm and protected. All socks are not the same, so we thought we would take a look at 35 Below Socks. 35 Below socks are socks are woven from fine threads of aluminum that are so soft you don’t even notice them. The promoters claim that the aluminum threads are woven into the nylon threads that make up the 35 Below Socks. These socks are being claimed to be breathable. They are supposed to have the ability to reflect the natural body heat that exists in your feet. By doing this helps to reduce moisture from perspiration with the end result being your feet feel dry and comfortable. The hype really focuses around not having to deal with socks that have become sweat laden which often happens when wearing heavy or woolen socks to help keep the feet warm. You can expect to pair $19.99 for 3 pairs of the 35 Below Socks socks. They are available in sizes small, medium and large. They are applicable for both men and women and you have a choice of black or white. They also come with a thirty day money back guarantee. There is really no commitment required when wearing the 35 Below Socks other than keeping them laundered enough so you always have a clean pair on hand. Laundering is done as you would do for normal sock laundering. The concept of using aluminum threads is a good one. For those that think this may just be a gimmick, there is progress being made with this type of technology. Researchers at Stamford University have experimented with using nanotechnology where they applied a silver nanowire coating to some fabrics to make them super insulators. It is indicated that this has the ability to reflect back over 90% of the body heat. Which is the same premise that the 35 Below Socks are based on. We are going to give the 35 Below Socks a thumbs up. We like the technology behind it. Plus the price is reasonable. Even for good quality standard socks, they would be in this price range. The fact that they are lightweight and comfortable is also important. They can be worn under regular socks if desired but the color of them will match with any outfit so it probably wouldn’t be necessary. Although the 35 Below Socks are structured for warmth, there are a lot of people that need to focus on specialty sock wear for other issues like dealing with circulation problems. We have talked about several different types in the past like the Miracle socks so you may want to check these out. What do you think? Do the 35 Below Socks work or not? Does the Bombas Socks Really Work? I bought ’em I’ve worn ’em. And they don’t work as advertised. I have neuropathy and bought them to keep my toes warm. Since toes are a part of the foot, I really hoped the socks would keep my feet (toes included) warm. I’ve worn all three pairs with no satisfaction. if you are dumb enough to think that a thin Nylon Sock is going to keep your feet warm you are kind of an idiot. The commercial said metal in thew socks “reflects” heat back into your feet! hahaha. Nylon is plastic by the way. And wearing plastic on your skin keeps the moisture on your feet. These socks are actually dangerous to wear and bad for the environment. These socks are a joke. Went hunting. Was not Below 35 degrees outside. I almost froze my feet off. I even wore a pair of soaks over the 35 below. Do not waste your money on these. Actually this company needs to be reported to the better business bureau. Well I Bought 2 Sets Of 3 Of The 35 Below Socks 1 Set For My Boyfriend And A Set For Myself And I Also Bought 2 Of The Beenies And I Am Totally Disappointed With The Socks Because They Haven’t Kept My Feet Warm At All, However I Am Satisfied With The Beenies! NOT what they claim, save your money and buy wool socks. Greatly disappointed. Got these socks in and to my surprise they worked as expected. The Temp. here in Mississippi for the last week or so has been averaging around 20. Got these socks and put them on as soon as I could sit down. They have worked good — each pair–for the last three days so I guess they will be ok. The one problem was the time it took to get the socks. They were ordered on Jan. 4th. I kept track of the order and they said the electronic notification was received on Jan. 11 then I received them on Jan 18. They came from California. I could have driven out there-picked up the socks-and been back here in less than 1/2 half the time it took them it took them to get electronic notification. Customer Service???? 35 Below Socks DO NOT work so DON’T waste your time and Money. Ordered Men’s Large. Tops are SO SMALL if worn they would cut circulation off PLUS they are so thin..Called for MONEY BACK GUARANTEE IF NOT TOTALLY SATISFIED return and after listening to a ridiculous CS rep, agreed to REFUND; however RETURN SHIPPING is not covered in GUARANTEE.Long story short after arguing for 10 min, agreed I was correct and they would send UPS Prepaid.. They did BUT ONLY if I drive 20 minutes and DROP OFF at UPS. This DOES NOT sound like a NO QUESTIONS ASKED, RETURN;REFUND!! So BEWARE and BE CAREFUL before ordering this JUNK PRODUCT! Thanks! Hopefully Amazon will REMOVE them soon from their product line….I didn’t order from Amazon but wish I had because RETURN REFUND wouldn’t be a problem!!! I don,t what people are talking about when they say these socks don’t work. I have worn them all fall and winter every day working on the ranch and hunting every single day and feet are always warm and dry . either working hard or sitting for hours. They work as advertised! These socks and gloves are a joke and a ripoff!!!! !